Destrung is a three piece band from San Diego. They have a sound similar to bands like The Violent Femmes & The Replacements. Vocally, Destrung conjures up images of Lou Reed & Stephen Malkmus. Jonas (the guitarist of Buck-O-Nine) plays guitar and sings lead vocals. Rob (bassist for the San Diego bands Crown Down and the Soultans) keeps the rhythm locked in on his Fender P-Bass. Eric (from San Diego bands Surf Report and the Mountain Men) serves up a mean beat on his drumkit. 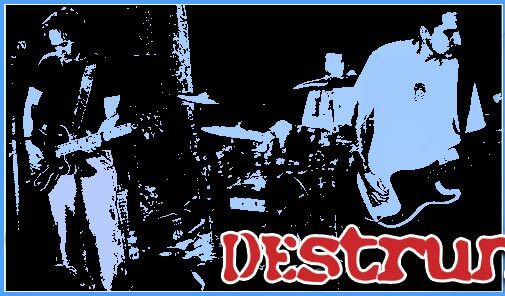 Destrung began jamming in May 2003, but the roots are much earlier. During Buck-O-Nine's years of constant touring, Jonas often escaped to a quiet place with an acoustic guitar & a notebook to work on the songs and melodies constantly streaming from his mind. Before long there were many new songs born from writing on the road. Some of them were used for Buck-O-Nine recordings, but many others were left without a home. In the spring of 2000, Jonas began playing several of these tunes live in a band he formed with three other members of Buck-O-Nine called the Winos. The Winos were going for a much different sound than of Buck-O-Nine. Their sound was dominated by a bluesy open tuned slide guitar and upbeat rhythms combined with more melodic sounds ala Elvis Costello. Several future Destrung songs were first played in the Winos set. The Winos disbanded after about a year. At this point, Jonas decided to start recording these songs he had been working on over the years at Earthling Studios, putting the music to a 2 inch reel to reel machine previously owned by Butch Vig. After recording intermittently for over a year, the new album was finally done and the project would be called Destrung. In May 2003, Jonas began jamming the Destrung songs live with Rob and Jeff from Buck-O-Nine on drums. Jeff eventually left Destrung and lucky for Jonas and Rob, Eric joined in May 2004. In May 2004, Jonas was finally able to release the CD People Watching to the public and the response has been very positive. Destrung has been happily jamming, working on new material and playing shows in the San Diego area. Check out the Destrung CD 'People Watching' to hear more. • Stay Tuned - More shows soon.